Continued from Teenage Mutant Ninja Turtles #8. Baxter awakes and finds that his robot body has repaired itself, to the extent that it has grown a new arm to replace the one that was lost! Casey and the Turtles are back at the apartment, when Nobody calls to inform them that the police have no record of Raphael. Leo suspects a cover-up, and Casey explains that Nobody is looking into that possibility. Don worries that their last battle was too high profile and that they’ll soon be discovered. He also decides that they need to find the Baxterbot to get some answers on what’s really going on. The guys head out. Three federal agents emerge from a van and enter Casey’s apartment, looking for information on Jones and April. As they search, Mr. Braunze is alerted to their presence. Braunze throws open the door to Jones’ place, surprising the agents, who pull out guns. Undaunted, Braunze attacks and makes short work of the feds. After the battle is complete, the mysterious Mr. Braunze grabs one of his adversaries and exercises some sort of mind-control powers on him. 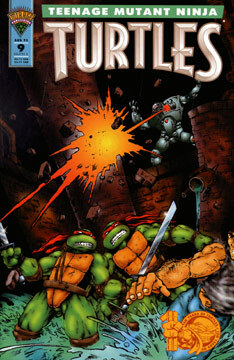 The Turtles and Casey are searching the sewers and come upon the Baxterbot, which fires at them and flees. The guys chase the robot deeper into the bowels of the city, down into a section of the sewer that’s covered in shallow water. As they proceed, the guys spot the Baxterbot – which is holding a severed live power cable, crackling with energy. The robot is going to drop the cable into the water and electrocute all five of its opponents! Just as Stockman releases the cable, Leonardo draws a katana and throws it – the blade pierces the line and imbeds both into the concrete wall, before the deadly electricity can reach the water. A tremendous surge of power erupts from the cable, arcs off of Leo’s sword and into the Baxterbot, frying it until it explodes into thousands of pieces. As the guys search the remains of the robot, they all wonder how Baxter got it to work. They find Stockman’s glasses inside of it – but none of them realize that, within the millions of circuits, somewhere lies Baxter’s brain. Not knowing that Baxter is gone with the robot, the guys lament that they’ve lost their only hope to find Raphael. Continued in Teenage Mutant Ninja Turtles #10. NOTE: Cover and indicia are erroneously dated August 1995.